Drop-in, slide-in or free-standing stove? Wall ovens with warmers? Other built in appliances like coffee makers micriwaves, convection ovens? Adding or removing an island? 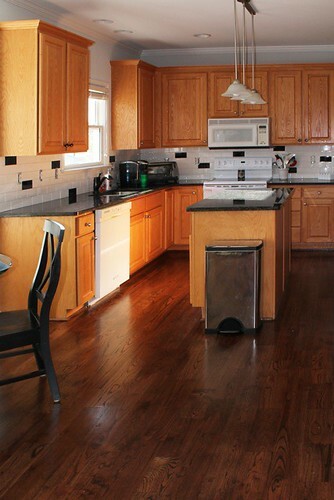 Here is an example of a kitchen remodel where new floors new counter tops and new back splash were added. A touch of new color on the walls and it feels like a completely new space. 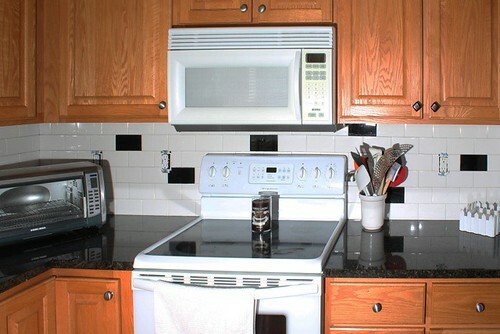 This homeowner decided to keep existing cabinets and appliances because all were in great working order. Remodeling a kitchen is one of the best investments you can make in your home. Whether you are looking to improve your resale value or just provide a better and more functional space for entertaining - this is a great place to invest in your home's value. The remodel project is only limited by your budget and space. You can start out with simple items like new knobs, updated flooring or maybe new counter tops. Or, consider a complete remodel that might include moving positions of your sink, refrigerator and stove. Once you have your budget and prioritized item list it is time to go virtual shopping. This is the process where you decide on the brands, styles, and colors for your materials. Be general at this point, but gather the samples that appeal to you. It is a good idea to start collecting counter top, cabinet, tile, flooring and any other sample materials you can gather and put them together in a portable plastic box. You can keep this with you as you are shopping for all of your kitchen accessories. This box of goodies will be invaluable to your General Contractor once you reach that stage. Meeting and choosing your General Contractor is a very important stage in the process. This must be someone that you feel you can work with and make the 1,000 decisions needed to have a successful project. Construction of this scope is messy business - and it is a lifesaver to have a partner with you that you can trust along the way. Lock down the major timelines for your project and don't stress about the small changes. Details will change (sometimes every day) as you encounter new decisions and make new choices. It is better to change your mind along the way and adjust plans than have to live with a bad choice in the years to come. Keep that major timeline on track and adjust the small items. If you have to change any large milestone; get it in writing as a change order from your Contractor. This keeps everyone on the same page.